Table 3 lists the operative steps for a transperitoneal laparoscopic ablation of a simple renal cyst. Electrocautery should be minimized during dissection of the colon in order to avoid accidental cautery injury to the bowel. Dissecting too close to the colonic mesentery can result in inadvertent injury to the mesenteric vessels and creation of a defect in the mesentery. If unrecognized or not repaired at the time of surgery, a mesenteric defect can result in an internal hernia in the postoperative period. When treating anteriorly located renal cysts, division of the lateral attachment of the kidney is not necessary and therefore these attachments should be maintained. For lateral or posteriorly located renal cysts, the lateral attachments of the kidney are released allowing the kidney to be rotated medially about its hilum. This provides the necessary exposure of the posterolateral surface of the kidney. For treatment of multiple renal cyst (e.g., autosomal dominant polycystic kidney disease), excision of most if not all of Gerota's fascia and perirenal fat may be required to expose all parenchymal surfaces and identify optimally all renal cysts. insertion. Under laparoscopic view, a 5-mm trocar is place below the xiphoid process in the abdominal midline, halfway between the umbilicus and xiphoid process. A second 10/12-mm trocar is placed just lateral to the rectus muscle at the level of the umbilicus to avoid injury to the epigastric vessels. These two trocars serve as the main working trocars. 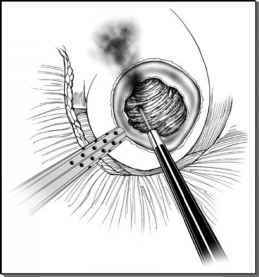 A 10-mm 30° laparoscopic lens is utilized during transperitoneal laparoscopic renal cyst ablation. With Debakey forceps in the 5-mm trocar and laparoscopic electrocautery scissors placed in the left lower quadrant 10/12-mm trocar, the line of Toldt along the descending colon is sharply incised from the splenic flexure down to the pelvic inlet. The colon and its associated mesentery are bluntly dissected with a suction irrigator device in a medial direction, exposing Gerota's fascia overlying the kidney. Great care must be taken to release the colorenal ligaments and develop the precise plane between Gerota's fascia and the mesentery of the colon. It may be necessary to divide the phrenocolic, lienorenal, and splenocolic ligaments in order to adequately expose the upper pole of the kidney and access superiorly located renal cysts. The operating table is maximally rotated toward the operating surgeon to allow the colon and small bowels to fall medial and away from the kidney, thus providing optimum exposure of the kidney and renal cyst(s) (Fig. 8). Alternatively, the retroperitoneal technique may be used for renal cysts located strictly at the posterior surface of the kidney (see the section entitled Retroperitoneal Laparoscopic Technique). Dissection and exposure of the renal vessels, pelvis, and ureter are typically not required during management of simple, nonhilar, peripheral renal cysts. For an exophytic renal cyst, the location of the cyst is often denoted by a bulge in the contour of the kidney. Gerota's fascia and perirenal fat overlying the renal cyst is excised sharply using electrocautery scissors, leaving an approximately 1-cm rim of exposed renal parenchyma around the cyst (Fig. 9). For intraparenchymal cysts, intraoperative laparoscopic ultrasound may be required to identify their precise location. FIGURE8 ■ Mobilization of colon and exposure of Gerota's fascia and kidney. The contour of a small middle pole and large lower pole renal cyst can be seen. FIGURE 9 ■ Excision of Gerota's fascia and perirenal fat overlying lower pole renal cyst. Aspirated fluid from a benign renal cyst is typically straw colored and if bloody or purulent, the possibility of a malignancy or infection should be considered, respectively. Only the anterior wall (i.e., extrarenal portion) of the cyst is generally excised, because efforts to remove the lining of the base of the cyst can result in parenchymal bleeding. the fluid is aspirated using a 20 to 30 cc syringe (Fig. 10). 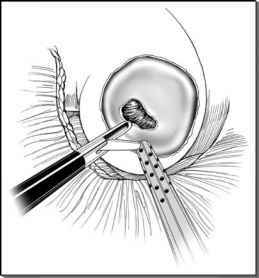 Alternatively, an 18-G spinal needle may be placed percutaneously under laparoscopic view to drain the cyst. With the cyst decompressed, the exposed anterior wall of the renal cyst is excised sharply with electrocautery scissors at its junction with the renal parenchyma (Fig. 11). Point electrocautery may be required for hemostasis. The cyst wall is then sent for permanent histopathologic analysis. FIGURE 10 ■ Needle aspiration of renal cyst fluid. FIGURE 11 ■ Excision of exposed renal cyst wall. Great care must be taken to avoid entry into the collecting system when performing biopsies, especially in cysts in close proximity to the collecting system. If violation of the collecting system is suspected, retrograde instillation of methylene blue or indigo carmine-stained saline via a previously placed ureteral stent can be performed and the collecting system sutured closed with 2-0 or 3-0 polyglactin suture. In cases where malignancy is noted on frozen section analysis, a partial or radical nephrectomy can be immediately performed either laparoscopically or by open surgery, depending on the skill and experience of the surgeon. 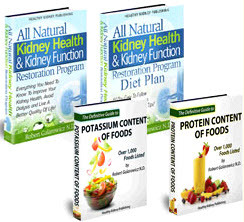 The kidney, ablated renal cyst(s), and drain are thus retroperitonealized, aiding in the containment and management of a postoperative urinoma or hematoma if one were to occur in the postoperative setting. using a 5-mm laparoscopic biopsy forceps (Fig. 12) and sent for frozen section histopathologic analysis. Great care must be taken to avoid entry into the collecting system when performing biopsies, especially in those cysts that are in close proximity to the collecting system. If violation of the collecting system is suspected, retrograde instillation of methylene blue or indigo carmine-stained saline via a previously placed ureteral stent can be performed and the collecting system sutured closed with 2-0 or 3-0 polyglactin suture. If the collecting system defect is large, fibrin glue sealant may also be applied as a secondary measure following suture placement. In cases where collecting system entry is confirmed, a closed-suction drain is left at the conclusion of the operation and the open-ended ureteral stent is exchanged for an indwelling stent. Limited coagulation of the base of the renal cyst may be performed using either monopolar electrocautery or a laparoscopic argon beam coagulator (Fig. 13), avoiding direct fulguration of the collecting system. Suture fixation of perirenal fat or omentum into the cyst cavity can act as a wick to prevent reaccumulation of cyst fluid. Alternatively oxidized cellulose gauze can be placed within the cyst defect (Fig. 14). For large cysts, infected cysts, or if entry into the collecting system is suspected, a closed suction drain can be left in place for one to two days. 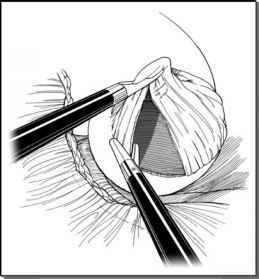 The drain can be inserted through a preexisting 10/12-mm trocar and brought out through a separate posterolat-eral incision site. The drain holes should rest in a dependent position relative to the renal cyst (Fig. 14). Upon completion of the renal cyst ablation and after meticulous hemostasis is accomplished, the ipsilateral colon can be brought back over the kidney and reattached to the abdominal sidewall, reconstituting the line of Toldt. This can be accomplished using 2-0 polyglactin sutures (Fig. 15). FIGURE 12 ■ Biopsy of lesion at cyst base using laparo- FIGURE 13 ■ Argon beam coagulation of renal cyst base. scopic biopsy forceps. FIGURE 14 ■ Packing of renal cyst defect with oxidized FIGURE 15 ■ Retroperitonealization of kidney and drain. cellulose gauze. The smaller midpole cyst has already been ablated and packed. A retroperitoneal drain can be placed medial and inferior to the kidney, if entry and repair of the collecting system are required. Final inspection of the surgical site is performed under low insufflation pressures (e.g., 5-10 mmHg) to assess for residual bleeding. The 5-mm trocar is removed under laparoscopic view and all 10/12-mm trocar sites are closed using the Carter-Thomason®c fascial closure device with 0-polyglactin suture. The skin incisions are closed with continuous 4-0 polyglactin subcuticular sutures followed by steristrips.